With a little luck and good timing, sometimes simply sticking a tree in the ground and walking away can be enough for it to survive. But knowing how to plant a tree the right way, will ensure success every time. In my book, there are seven steps for planting success which I share below. Suffice it to say; I’ve learned these all-important steps mostly by trial and error. It’s always the best way to learn, especially when it comes to gardening. Trees have been described as the lungs of the earth for a good reason. Without them, there would be no life on this planet. That’s reason enough to plant as many as we can. But when you learn just how important they are for so many reasons, you begin to understand my passion for trees and why we need more. That’s led to a lifelong crusade to encourage people to plant more trees. Or even one. So it only stands to reason how thrilled I was to team up with Lands’ End recently to encourage everyone to #PlantATree in celebration of Earth Day this year. So whether this is your first tree planting, or you’ve planted a forest by now, we’re always learning. Knowing how to plant a tree the right way — especially now, considering such unprecedented climate conditions — will ensure your efforts will not be in vain. To give you the whole story, check out this video we created to walk you through how to plant a tree the right way, along with the 7-steps for getting it right every time. 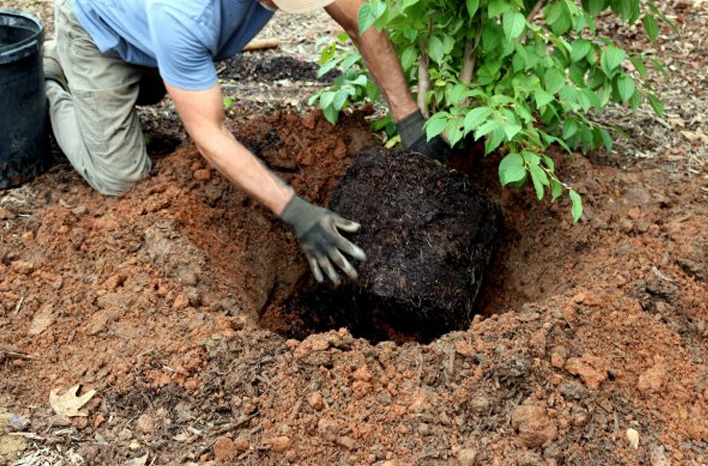 Trees (and shrubs) can be planted any time of the year that you can dig the proper planting hole. However, there are better times than others for multiple reasons. Suffice it to say, the more time you can put between when you plant a tree, and the arrival of summer, the better. 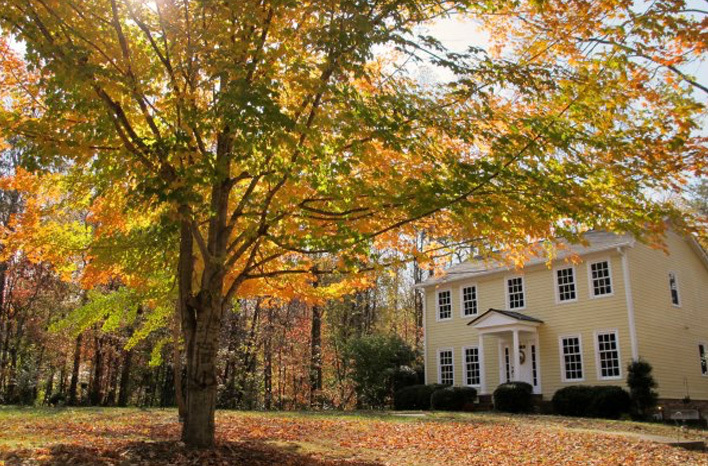 That makes fall the very best time of year to relocate trees and shrubs or plant new ones. Early spring is a popular time as well. An easy way to know if your hole is at the right depth is to take your shovel handle and lay it across the grade. The top of the root ball or tree flare should be at or above the handle level. 1. Prepare the proper planting hole. When preparing any hole for planting, make it three times wider than the current root mass but never deeper than the plant was growing in its previous environment. An even better guide to trees is to look for the flare of the trunk near the soil level. 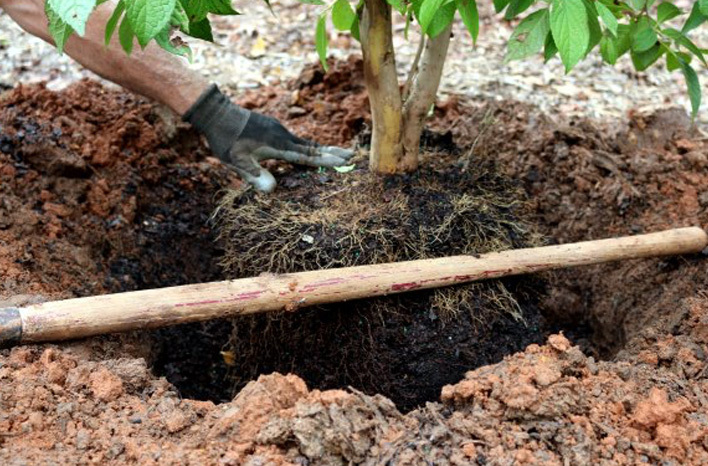 Don’t place the tree in the planting hole so deep that any part of that flare is covered with soil. The truth is, even nurseries sometimes put plants in containers too deeply. There have been many times where I’ve had to pull away soil to find the base of the trunk flare and true surface roots. Make a habit of checking this. 2. Plant high. I go even one step further by placing trees and shrubs in their new environment with up to 25% of the root ball higher than the surrounding soil level. I then taper soil up to cover all the roots and add a generous layer of mulch above that. 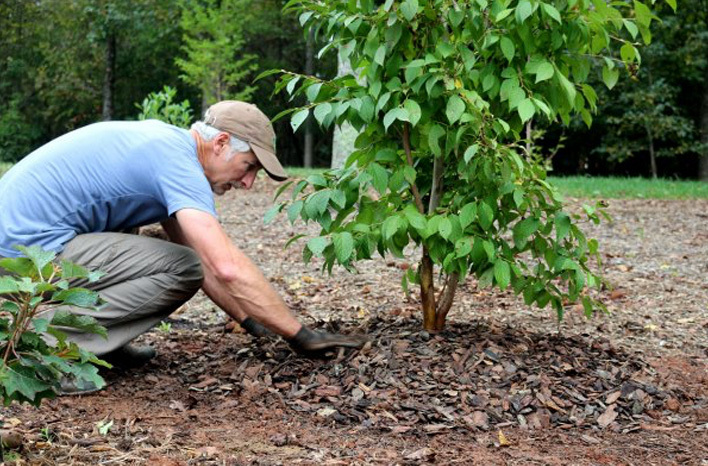 Newly disturbed soil tends to settle, and shrubs and trees planted at grade can quickly settle below grade and succumb to root rot or disease. In my book, it’s always better to plant a tree or shrub slightly high and allow the area to drain away rather than for a plant to sit in a bowl and collect excess water. Don’t be afraid to break up the roots of a pot plant tree or plant to free them of their circular growth pattern. In fact, you must. Failure to do so now (your last chance) can doom your plant to lackluster performance at best. 3. Inspect the roots and disturb when necessary. Once the plant is out of its container, look at the roots. If they are densely bound in a circular pattern or have started growing in the shape of the container (even slightly), break up the pattern. It’s vitally important to stop this pattern now. The biggest mistake you can make at this point is to place a rootbound plant into the ground as is. Unless you break up the pattern, you’ve likely sentenced the plant to a slow death. At a minimum, it will likely never establish or reach a fraction of its potential. Don’t worry about hurting the roots or losing soil as you break the roots apart or even cut some away. Better to give them a fresh start than allow the constrictive pattern to only get worse below ground. While you don’t want to be any rougher than necessary, do what you must to arrest the pattern. I often scratch my fingers across the sides and bottom of the root mass in mild cases. In more severe situations, I’ll slice up the roots vertically with a pruning saw, hack off the bottom inch or so, and or pull apart the root mass to clearly create new opportunities for non-circular new root development. Unless you can dig a hole large enough for the eventual mature root zone and amend the entire area, simply backfill with the existing native soil. 4. Don’t amend the soil. Contrary to traditional planting methods, contemporary research indicates that you should not amend the hole with an additional organic material (unless you intend to amend the entire area where roots will eventually grow). Roots growing in amended soil rarely venture into the harder native soil. 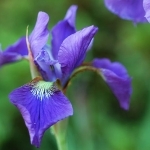 The long-term affect is a smaller root system, reduced growth, and a less hardy plant. Instead, simply break up the clumps in existing soil, remove the rocks and backfill. Studies show plant roots growing in only the native soil did a better job at establishing and expanding beyond the original hole. I find the best and easiest way to eliminate air pockets during planting is to blast the backfilled soil with a stiff stream of water after refilling the hole about half way. Then again after all the soil has been added back. 5. Eliminate air pockets. While you could lightly tamp or hand-pack the soil around the plant roots to ensure good soil-to-root contact, I prefer to add a stiff spray of water to the hole after backfilling half way. Not only does it provide needed moisture but the water also helps eliminate air pockets that could otherwise result in dead roots or worse (without compacting the soil too much). Finally, water again gently but thoroughly once all the soil is in place. 6. Add mulch. Starting about two inches from the trunk (leave this area exposed), place roughly two inches of organic matter such as shredded leaves, or ground bark or nuggets around the plant, at least out to the drip line. Further is better. 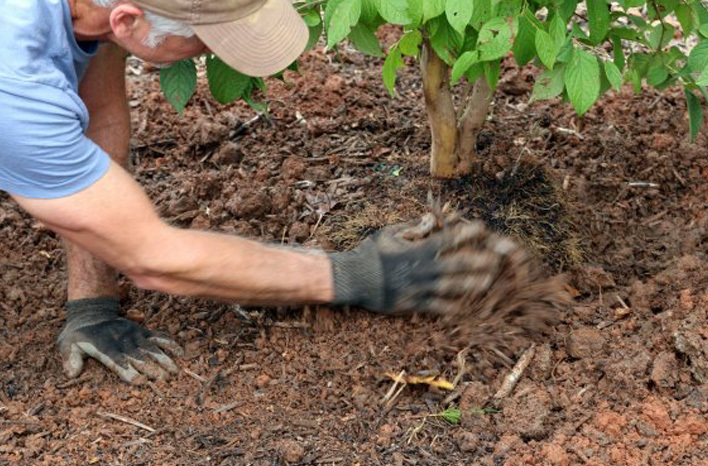 Mulch helps retain much-needed moisture and helps keep roots cooler near the surface—a very important requirement for newly installed plants. Perhaps the most important step during the planting process is to keep up with the watering until your plant is fully established. That can take longer than you think. Soaker hoses or drip irrigation on automatic times makes this an easy process. The key to proper watering and establishment is slow and deep irrigation. It’s not practical to do that by hand. 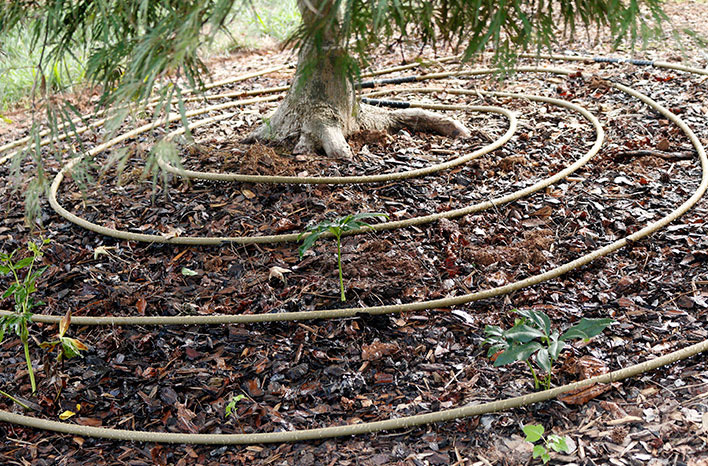 The only way to establish trees properly through irrigation is with soaker hoses or drip irrigation. The slow and deep irrigation allows the soil around the roots to saturate, so the roots have time to absorb the moisture while avoiding the excess runoff. Short, manual blasts of water from an overhead hose or sprinkler system simply don’t come close to providing the same effectiveness for water delivery. I water newly planted trees every day for about the first week. For the next two weeks, I ease off to about every other day. Then gradually ease back from there. However, there’s a fine line between watering enough and watering too much—especially with large trees that arrive with root balls wrapped in burlap. These trees have lost all their feeder roots when dug from the ground. Providing adequate water is critical to their survival and establishment. That said, I’ve killed more than one tree like this by overwatering. Even if you prepare a large planting hole, when drainage is poor, the root ball may be sitting in water and drown. There’s no easy way to know how wet the soil is deeper into the planting hole. The best advice I can offer is to pay close attention to how the tree responds (and all your plants for that matter). While it’s common for them to lose up to half their leaves to transplant stress (a normal part of the process), more can indicate a potential problem. If you sense the tree is responding poorly, and you are watering consistently, you’re likely over-watering. 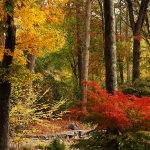 If the leaves are turning brown, drying up, and falling off, and the soil appears dry, water more. 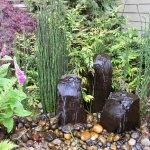 To add to the challenge, soil that appears dry at the top may be very wet a few inches down. And the opposite is true as well. All the more reason it is important to apply your detective skills based on observation and knowing how much or little you’ve been watering. In the first few weeks, soil that is moist but not soggy is your target range. And depending on what you’re using to deliver the water will affect how long you need irrigate per session. So there’s no simple answer. One of the best time-savers you can find to lighten the load and put your irrigation duties on auto-pilot is to use soaker hoses and drip irrigation combined with portable battery-operated timers. I cannot stress the importance and time-saving benefits enough! 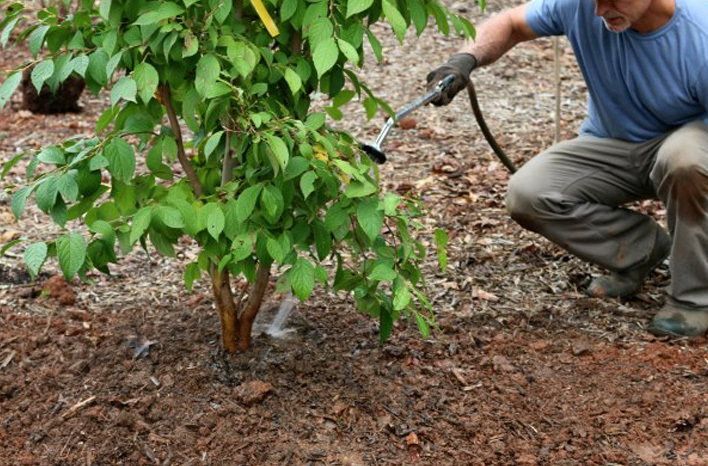 If you plant to fertilize, I don’t suggest doing so until you know your trees or shrubs have taken to their new environment through the successful establishment. All energy should be concentrated on root development first. Adopt the walk-before-you-run approach. But even then, I still like to play it safe by using a slow-release, non-burning organic fertilizer (such as Milorganite) that won’t overtax my plants. While all the above steps are essential, your active engagement in monitoring newly planted trees for signs of distress over time will be the ultimate deciding factor in your tree planting success. Make any necessary adjustments in real-time, and you can likely reverse a potentially downward spiral into a tree that will live a happy and very long life. Please join me this Earth Day and let’s all #PlantATree.